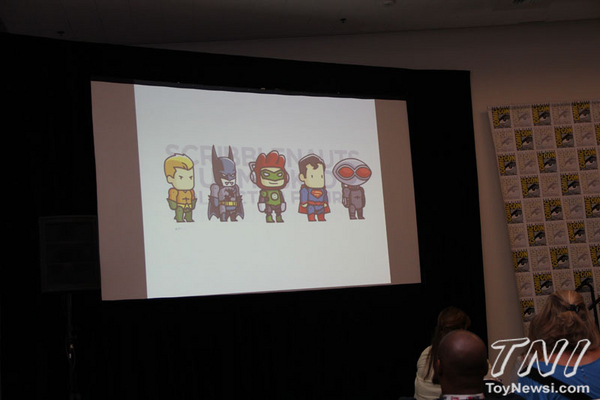 Okay, this is NOT Mattel’s DC figures! I got it this time, I promise! So, from their Panel, we’ve got some news! -The 50th Batman Black & White statue is going to come out. And wow! I never would have thought it could last that long! Is there somebody out there who’s got each one? -Speaking of statues, they have a lot coming up. Greg Capullo Batman & The Joker, Man of Steel, Wonder Woman, and all sorts of other stuff. -Now, as far as figures go? As I said, there’s stuff for Arrow. -Okay, Scribblenauts fever is going down. Suicide Squad is getting figures, including Juggalo-Harley Quinn. -And just like Arkham Asylum and Arkham City, Arkham origins will get toys. Doesn’t make me any more optimistic about a game that involves none of the staff of the two good installments. And let's not forget the Designer Series Greg Capullo Batman, Nightwing and Talon. They've got the super-articulation of the recent Arkham City Batman, but refined. Those things have me absurdly excited. We might just be getting THE 6-inch scale Batman.